The Accounts specialist specializes in managing the clients’ accounts and monitors the strategies relating to it, it is the duty of the Accounts specialist to ensure that the customers’ requests are handled well apart from rendering support to customers. Additionally, the Accounts Specialists have to take charge of completing the customers enrollment, conversion mailing, responding to request, maintaining quality service and resolving issues. 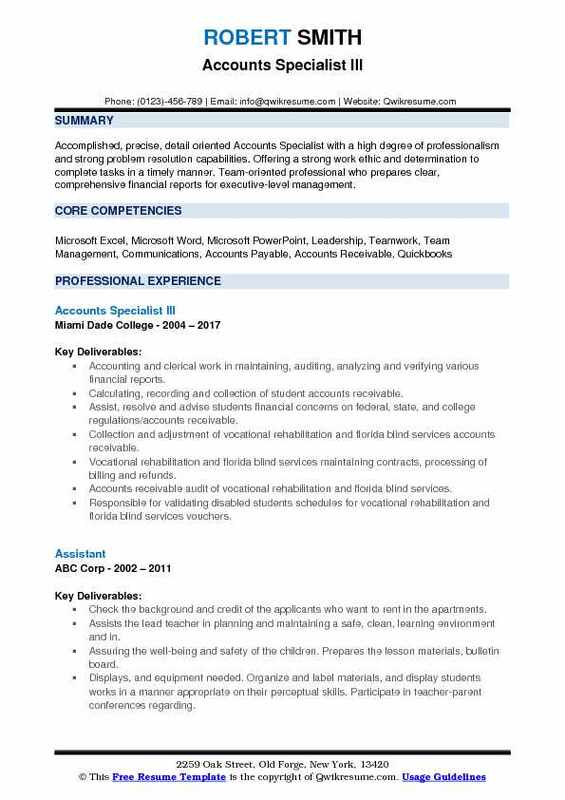 Employers look out for Accounts Specialist Resume sample that showcases organizational skills, customer friendly attitude, analytical thinking, and pro-active traits. 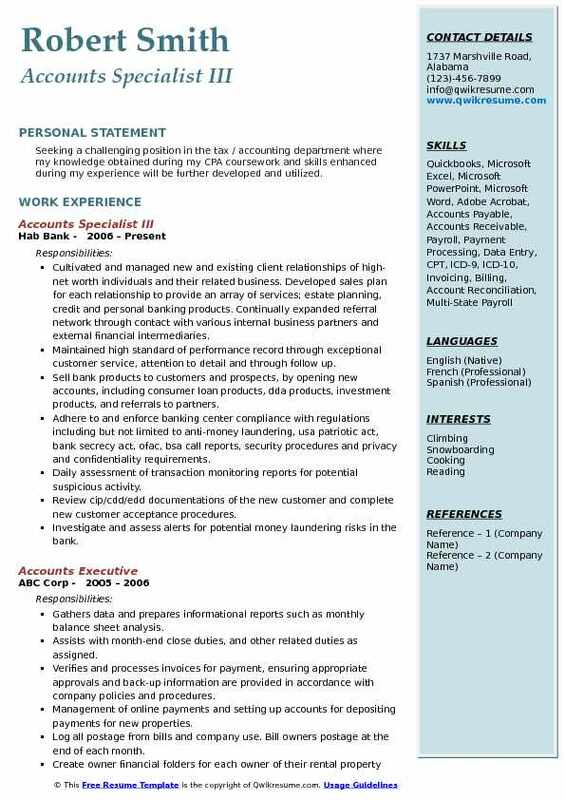 The best resume for seeking Accounts Specialist job position should depict graduation in finance, marketing, accounting, Business Administration or sales. However, Candidates with a Masters Degree in the specified field with proven ability to solve problems get an added advantage. Headline : An organized and detail oriented individual who works well with limited or no supervision, previous experience managing various duties in offices and acting as a supervisor, experience handling financial transactions and maintaining detailed financial records. Great ability to analyze financial, employment data and organize detailed information. Contact customers through effective telephone collection methods to determine the reason for delinquency, verify all information, evaluate the customers willingness and ability to pay, and resolve the account to current status or institute measures to conclude the account satisfactory. Completes any updates on account information, and any required paperwork related to a transaction. Processes credit card payments, and credit using online pay portal "paydici". Negotiate corrective action on delinquent accounts to ensure most profitable resolution. Transferred accounts in an assigned portion of a portfolio from delinquent to current status. Control losses by the number of repossessions and charge offs assigned in the collection queue. Locate through effective skip tracing techniques for customers, and collateral to minimize potential loss situations. Make timely recommendations of corrective action to be taken to resolve delinquency. Maintain follow up on required customer insurance coverage and institute corrective action when deficient coverage discovered. Process, follow up, and resolve inbound collection, and customer service telephone inquiries. Initiate, mail, and follow up with necessary processing of all customer correspondence. Approve extensions, deferments, and due date changes within authorized limits to promote customer performance of contractual obligations. 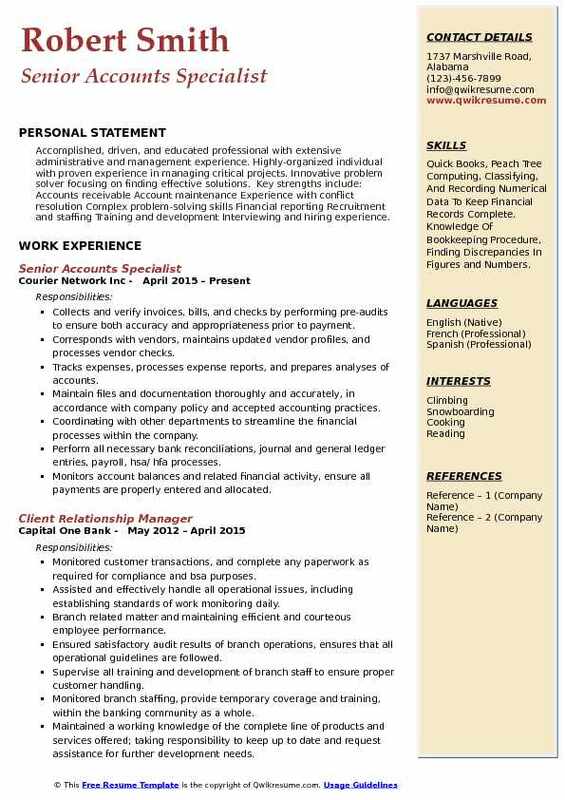 Summary : Accomplished, precise, detail oriented Accounts Specialist with a high degree of professionalism and strong problem resolution capabilities. Offering a strong work ethic and determination to complete tasks in a timely manner. Team-oriented professional who prepares clear, comprehensive financial reports for executive-level management. Accounting and clerical work in maintaining, auditing, analyzing and verifying various financial reports. Calculating, recording and collection of student accounts receivable. Assist, resolve and advise students financial concerns on federal, state, and college regulations/accounts receivable. Collection and adjustment of vocational rehabilitation and florida blind services accounts receivable. Vocational rehabilitation and florida blind services maintaining contracts, processing of billing and refunds. Accounts receivable audit of vocational rehabilitation and florida blind services. Responsible for validating disabled students schedules for vocational rehabilitation and florida blind services vouchers. Resolve student financial issues with vocational rehabilitation agencies and florida blind services. Assisting in the process of recovering funds due to the college and resolution of student financial issues in the west, homestead and hialeah financial aid campuses. Responsible for filling different invoices and billing in correspondent file. Provide departmental support in creating spreadsheets, photocopying, scanning and filing. Retrieving messages from multiple lines and recurring calls for student billing and 1098-t form inquiries. 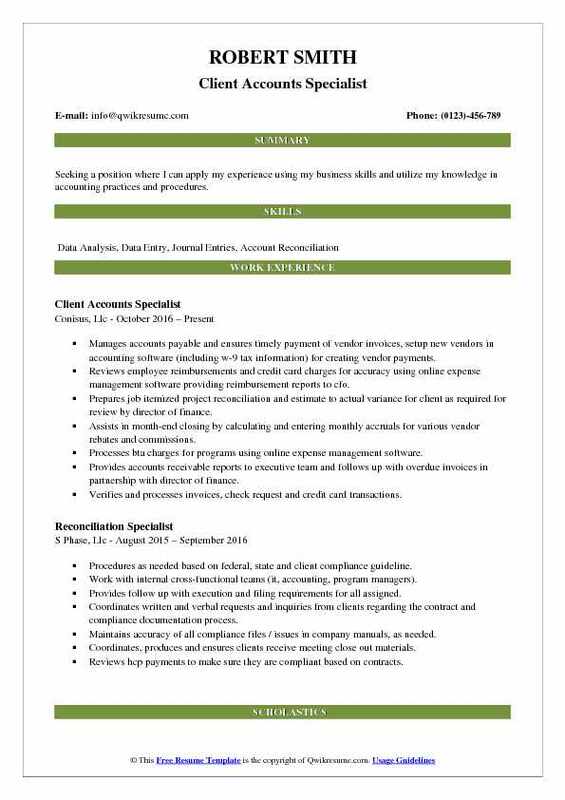 Objective : Seeking a position where I can apply my experience using my business skills and utilize my knowledge in accounting practices and procedures. Manages accounts payable and ensures timely payment of vendor invoices, setup new vendors in accounting software (including w-9 tax information) for creating vendor payments. Reviews employee reimbursements and credit card charges for accuracy using online expense management software providing reimbursement reports to cfo. Prepares job itemized project reconciliation and estimate to actual variance for client as required for review by director of finance. Assists in month-end closing by calculating and entering monthly accruals for various vendor rebates and commissions. Processes bta charges for programs using online expense management software. Provides accounts receivable reports to executive team and follows up with overdue invoices in partnership with director of finance. Verifies and processes invoices, check request and credit card transactions. Imports activity from internal proprietary database into accounting system. Resolves any issues directly with vendor or coordinator to ensure that payment. 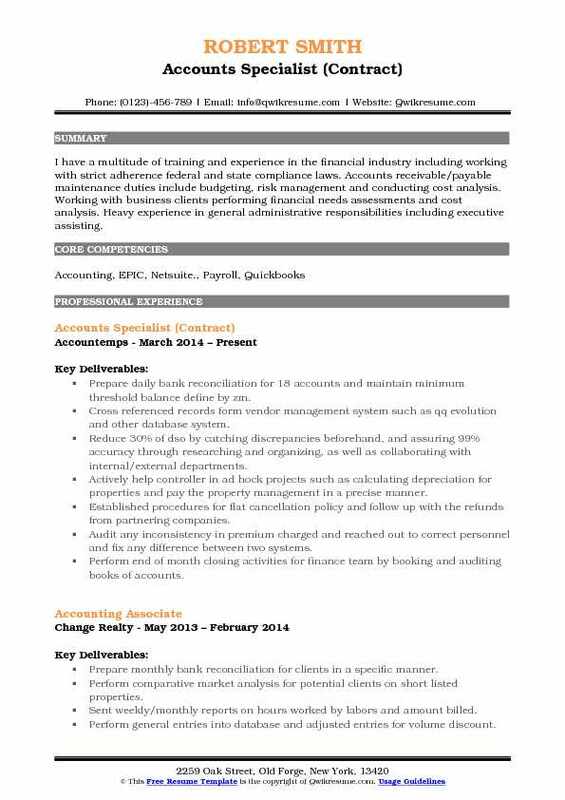 Objective : Seeking a position to continue building knowledge of general accounting procedures in an industry with growth potential. I endeavor to work in a team environment and use my skills to assist in the company growth. Audit financial statements and advise the director of finance and the corporate office of miscoding issues. Assist in developing and forecasting yearly budgets as well as, audits and control. Create billing accounts by following established procedures of weekly collection calls on past due accounts that are over 30 to 60 days, then i share this information concerning the receivables at weekly credit meetings with my general manager and sales staff. File credit card transactions and daily reports from night audit and balance all credit card transactions when there is a problem with the computer system to resolve guest discrepancies. Provide end of the month reports as specified by the director of finance. Prepare input sheets for processing payroll, as well as monitor the payroll system on a constant basis for accuracy. I also complete the entire payroll process and balance payroll bi-weekly. Ensure that the hotel complies with the established credit and collection procedures, with particular attention to front office, group and meetings/banqueting processes. Provide daily report (revenues, occupancy, and expenses) for distribution to hotel executive managers and the corporate office. Ensure that the daily food and beverage revenue is balanced and tips for employees are paid. Summary : Seeking a challenging position in the tax / accounting department where my knowledge obtained during my CPA coursework and skills enhanced during my experience will be further developed and utilized. Cultivated and managed new and existing client relationships of high-net worth individuals and their related business. Developed sales plan for each relationship to provide an array of services; estate planning, credit and personal banking products. Continually expanded referral network through contact with various internal business partners and external financial intermediaries. Maintained high standard of performance record through exceptional customer service, attention to detail and through follow up. Sell bank products to customers and prospects, by opening new accounts, including consumer loan products, dda products, investment products, and referrals to partners. Adhere to and enforce banking center compliance with regulations including but not limited to anti-money laundering, usa patriotic act, bank secrecy act, ofac, bsa call reports, security procedures and privacy and confidentiality requirements. Daily assessment of transaction monitoring reports for potential suspicious activity. Review cip/cdd/edd documentations of the new customer and complete new customer acceptance procedures. Investigate and assess alerts for potential money laundering risks in the bank. Ensure efficient identification and monitoring of suspicious activities and transactions. Review cash log to ensure timely filing of properly completed currency transaction reports (ctr) and suspicious activity reports (sars). Prepare reports for the compliance manager (enhanced due diligence - cash trend; internal bsa edd; bsa call reports; msb reports; non profit edd and other required reports). Objective : To secure a position within a strong and reputable company, in the area of finance. I want to apply my skills and knowledge to a challenging position in order to gain work experience while pursuing my Masters degree. 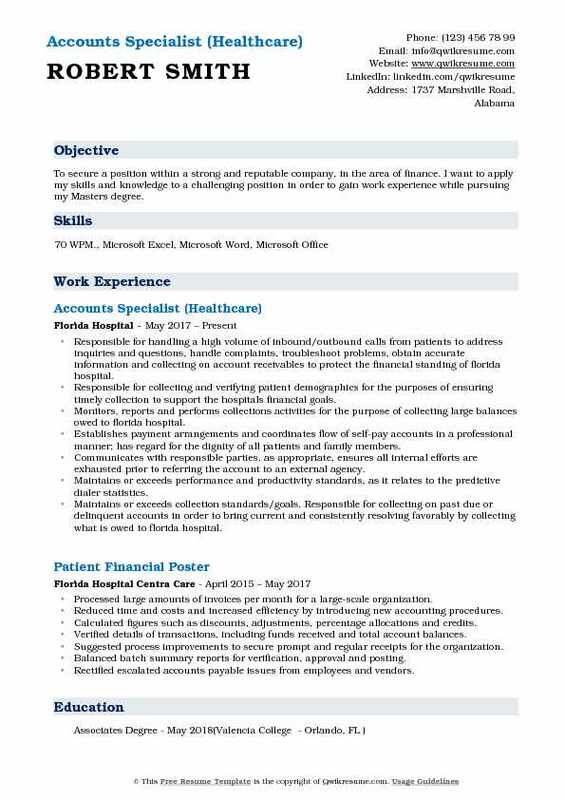 Responsible for handling a high volume of inbound/outbound calls from patients to address inquiries and questions, handle complaints, troubleshoot problems, obtain accurate information and collecting on account receivables to protect the financial standing of florida hospital. Responsible for collecting and verifying patient demographics for the purposes of ensuring timely collection to support the hospitals financial goals. Monitors, reports and performs collections activities for the purpose of collecting large balances owed to florida hospital. Establishes payment arrangements and coordinates flow of self-pay accounts in a professional manner; has regard for the dignity of all patients and family members. Communicates with responsible parties, as appropriate, ensures all internal efforts are exhausted prior to referring the account to an external agency. Maintains or exceeds performance and productivity standards, as it relates to the predictive dialer statistics. Maintains or exceeds collection standards/goals. Responsible for collecting on past due or delinquent accounts in order to bring current and consistently resolving favorably by collecting what is owed to florida hospital. Responsible for participating in extensive collections and customer service training to support patient satisfaction targets. Adheres to hippa regulations by verifying pertinent information to determine caller authorization level receiving information on accounts. Summary : Seeking a challenging position in a business field to utilize my leadership and project management skills including problem solving, planning, organizing and managing budgets to achieve corporate goals. Daily routine involved handling daily a/p and a/r processes, used to supervise accounting clerks and help them process invoices accurately and timely, used to purchase orders, create income and expense reports, debit and credit memos, managed vendor and supplier relations, reconciling statements, and receiving and payment transactions. Maintained adherence to company policies, accounting, international financial reporting standards (ifrs), and to government policies. Managed the accurate and timely processing of up to 20000 invoices ($5 million) per month for large, and multinational organization. Assessed and reconciled all accounting ledgers at the end of the month. Helped in training new employees to increase efficiency, and gains in an effective manner thus helping company save significant time and cost -savings. Enabled effective and sound bookkeeping system with reconciliation on daily routine for most of the ledgers and statements thus leading to no fault to be found in internal and external audit of my department. Instituted thorough cross-checking of daily transactions, ledgers and statements, in an effective manner so records do present a true and fair view. Renegotiated payment terms with buyers and sellers, leading company to get better quality material, at a reasonable price, thus leading into favorable variances. Composed effective accounting and ad-hoc reports summarizing data for admin, packing, export, finance, human resource and other departments. Consistently maintained accuracy in calculating figures and amounts such as discounts, interest, commissions, proportions and percentages. Objective : I have a multitude of training and experience in the financial industry including working with strict adherence federal and state compliance laws. 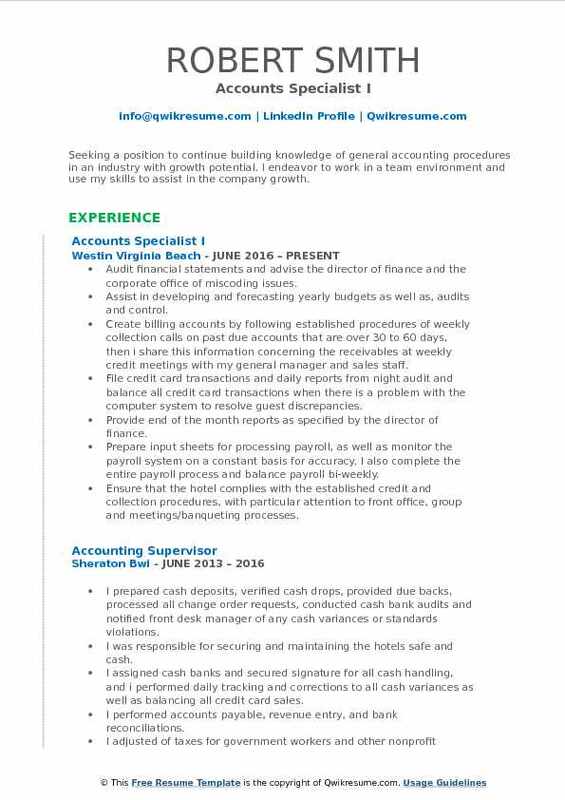 Accounts receivable/payable maintenance duties include budgeting, risk management and conducting cost analysis. Working with business clients performing financial needs assessments and cost analysis. Heavy experience in general administrative responsibilities including executive assisting. Prepare daily bank reconciliation for 18 accounts and maintain minimum threshold balance define by zm. Cross referenced records form vendor management system such as qq evolution and other database system. Reduce 30% of dso by catching discrepancies beforehand, and assuring 99% accuracy through researching and organizing, as well as collaborating with internal/external departments. Actively help controller in ad hock projects such as calculating depreciation for properties and pay the property management in a precise manner. Established procedures for flat cancellation policy and follow up with the refunds from partnering companies. Audit any inconsistency in premium charged and reached out to correct personnel and fix any difference between two systems. Perform end of month closing activities for finance team by booking and auditing books of accounts. Extract commission data from vendors erp system and upload to our company system. 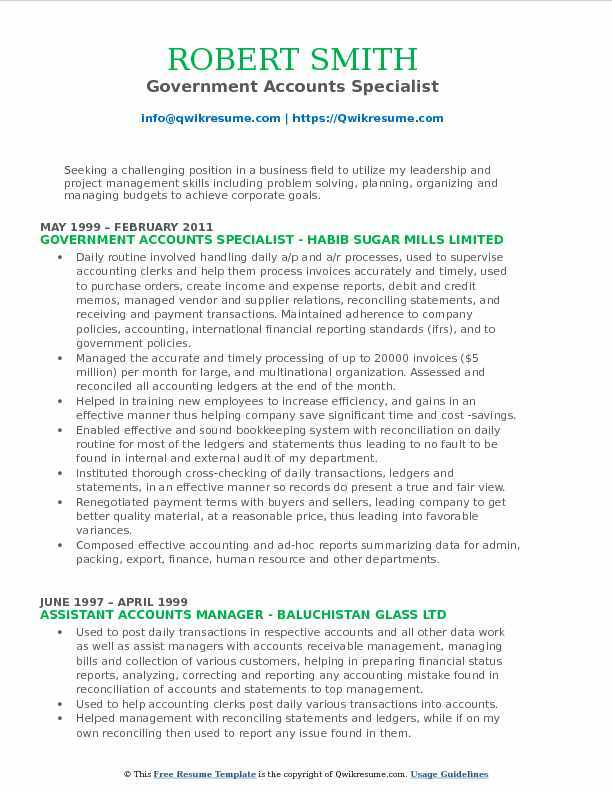 Summary : Accomplished, driven, and educated professional with extensive administrative and management experience. Highly-organized individual with proven experience in managing critical projects. Innovative problem solver focusing on finding effective solutions. 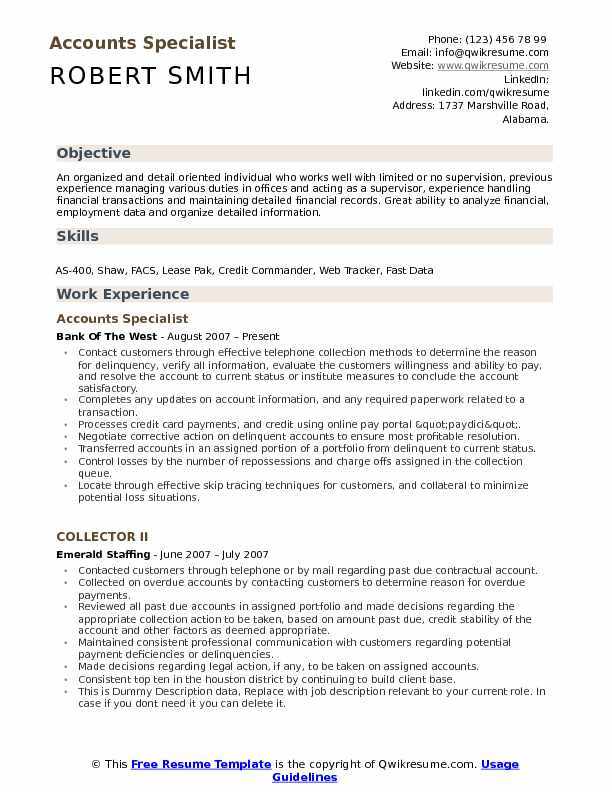 Key strengths include: Accounts receivable Account maintenance Experience with conflict resolution Complex problem-solving skills Financial reporting Recruitment and staffing Training and development Interviewing and hiring experience. Skills : Quick Books, Peach Tree Computing, Classifying, And Recording Numerical Data To Keep Financial Records Complete. Knowledge Of Bookkeeping Procedure, Finding Discrepancies In Figures and Numbers. Collects and verify invoices, bills, and checks by performing pre-audits to ensure both accuracy and appropriateness prior to payment. Corresponds with vendors, maintains updated vendor profiles, and processes vendor checks. Tracks expenses, processes expense reports, and prepares analyses of accounts. Coordinating with other departments to streamline the financial processes within the company. Perform all necessary bank reconciliations, journal and general ledger entries, payroll, hsa/ hfa processes. Monitors account balances and related financial activity, ensure all payments are properly entered and allocated. 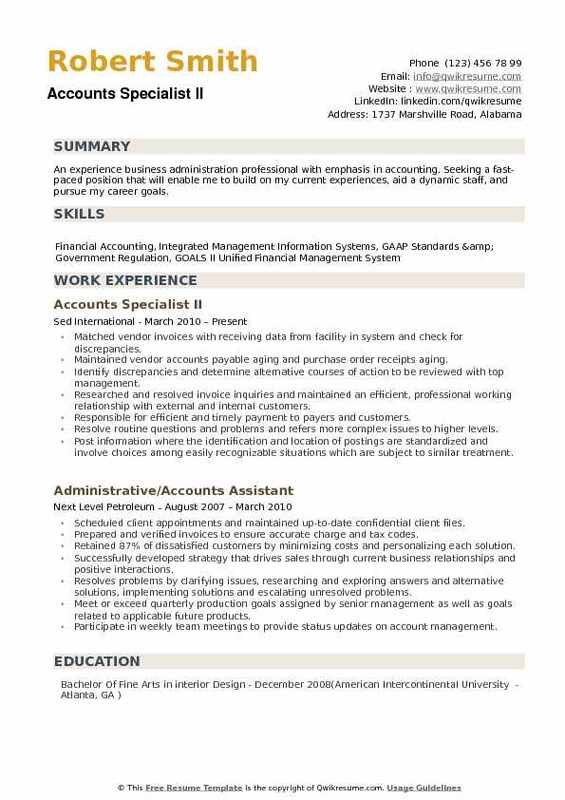 Summary : An experience business administration professional with emphasis in accounting. Seeking a fast-paced position that will enable me to build on my current experiences, aid a dynamic staff, and pursue my career goals. Matched vendor invoices with receiving data from facility in system and check for discrepancies. Maintained vendor accounts payable aging and purchase order receipts aging. Identify discrepancies and determine alternative courses of action to be reviewed with top management. Researched and resolved invoice inquiries and maintained an efficient, professional working relationship with external and internal customers. Responsible for efficient and timely payment to payers and customers. Resolve routine questions and problems and refers more complex issues to higher levels. Post information where the identification and location of postings are standardized and involve choices among easily recognizable situations which are subject to similar treatment. Provided supporting documentation as requested by internal a/p auditors.